Today [2/20/17], at dawn, at least fifty of our Buffalo brothers were shoved into trailers and hauled to slaughter. There are 1,500 Bison that are slated to be captured and slaughtered. Yellowstone Herd Bison are descendants of twenty-three Great Plain's Bison who survived the 19th century extermenation campaign, managing to eke out a living in the corner of the National Park. Once, they numbered 60 million, and ranged the entire continent, supporting millions of Indigenous lives. Since 1901, they have managed to repopulate in this harsh reservation style habitat. However, each year through government mandate, Buffalo are trapped and slaughtered by contract killers–the pregnant mothers have their offspring ripped from their wombs. These last remaining Bison live precariously under govermental control and continue to be pushed into oblivion. Our communities are made up of many different nations, belief systems and lifestyles. Each member plays a role and in a way that role resembles nature. Honeybee's work together to maintain their colony; buffalo, when going through hardship, will circle and protect the weak and when attacked, trees will signal other trees to start their self defense response before being invaded. On a micro level the change we create in every community is momentous as it encourages and unifies on a macro level. 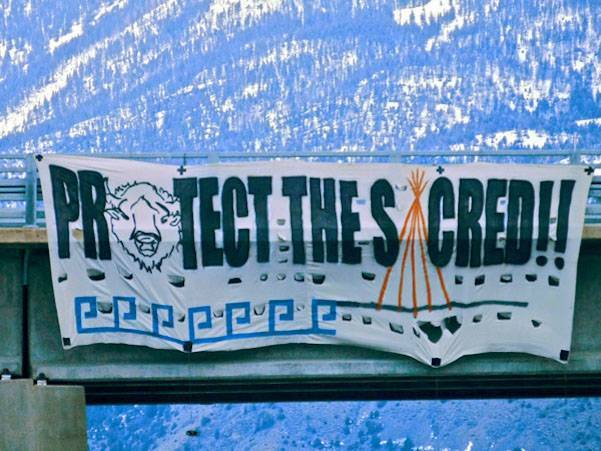 This is a call to our relatives from all four directions to step forward in prayer and in action, to put an end to genocide and save the last wild roaming Buffalo, without the Buffalo we cease to exist. Wake up! The Buffalo need your help! In Memory of Rosalie Little Thunder, All Buffalo Nations, The Ancestors, and All Future Generations. For Mni Wiconi! The Montana-based wild bison advocacy group, Buffalo Field Campaign, applauds this courageous action which will help draw more attention to the growing opposition to the maltreatment and slaughter of the country’s last continuously wild buffalo herds.